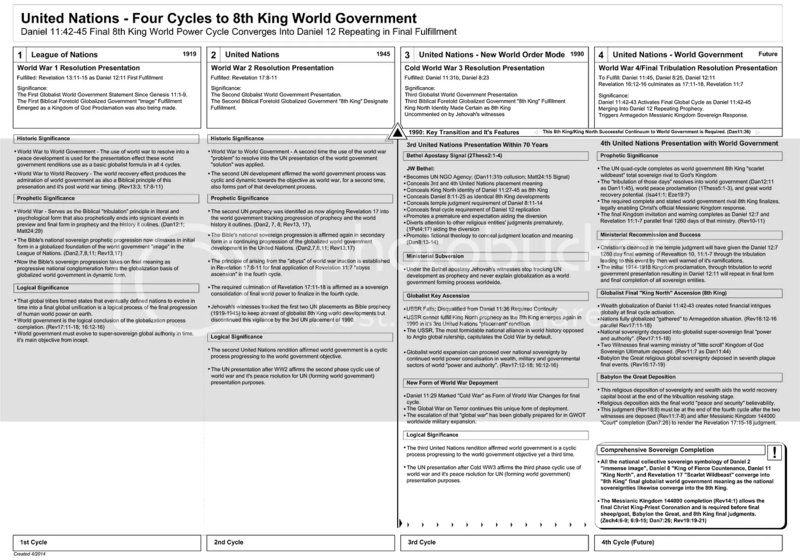 These graphics depict prophetic frameworks to fulfill in a final fulfillment cycle that basically repeats the first Jehovah’s witnesses (IBSA) ministerial meaning as a Kingdom proclamation deployed into WW1 (tribulation principle) which tribulation resolved into the first 8th King designate League of Nations foundational presentation. 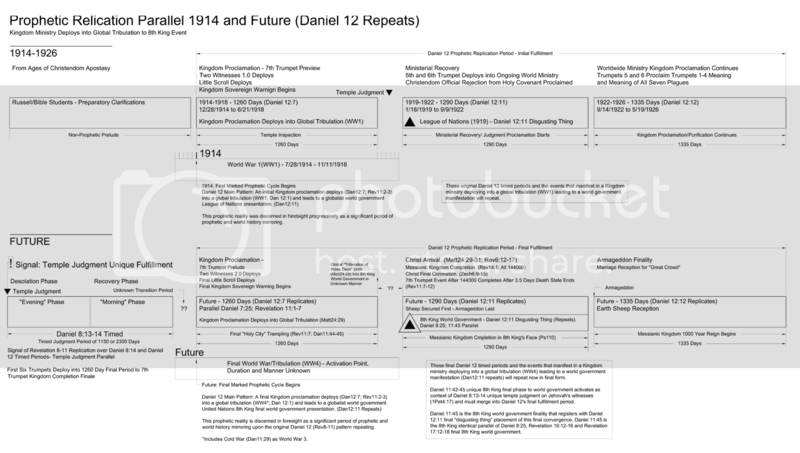 The 1914-1918 (Dan12:7), 1919-1922 (Dan12:11), and 1922-1926 (Dan12:12) phases will repeat in a final fulfillment cycle and respect their original sovereign meanings enroute to 8th King “image” culminating into full “scarlet wildbeast” world government in a final cycle of Revelation 17:8-18. It is not just the “image of the wildbeast”, but full 8th King world government that will emerge from this final cycle of prophecy outlining the final cycle of Adamic world history. 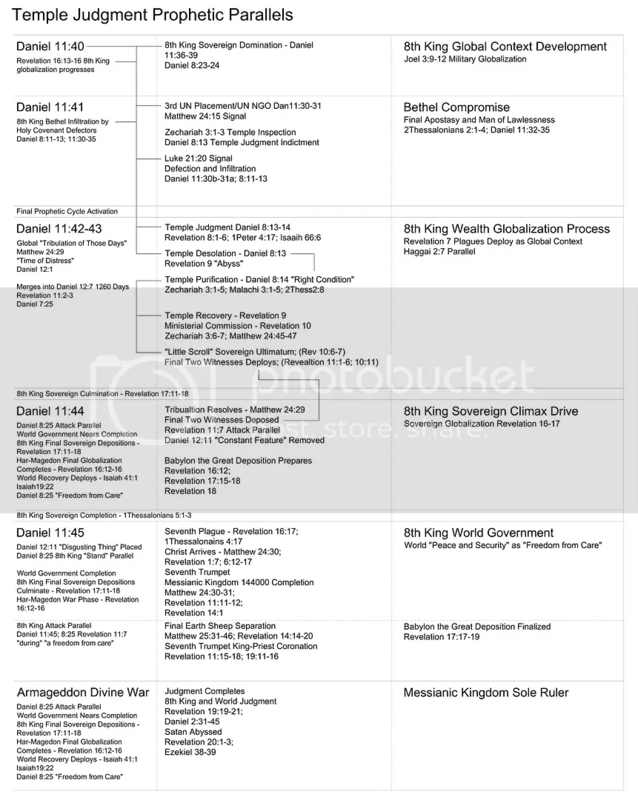 That basic Kingdom pattern of the 1914-1918 preview meaning, through a global tribulation resolved (Matt24:29, as was WW1), leading to a final 8th King world government presentation, will repeat Daniel 12 and Revelation 8-11 in also final completing form. 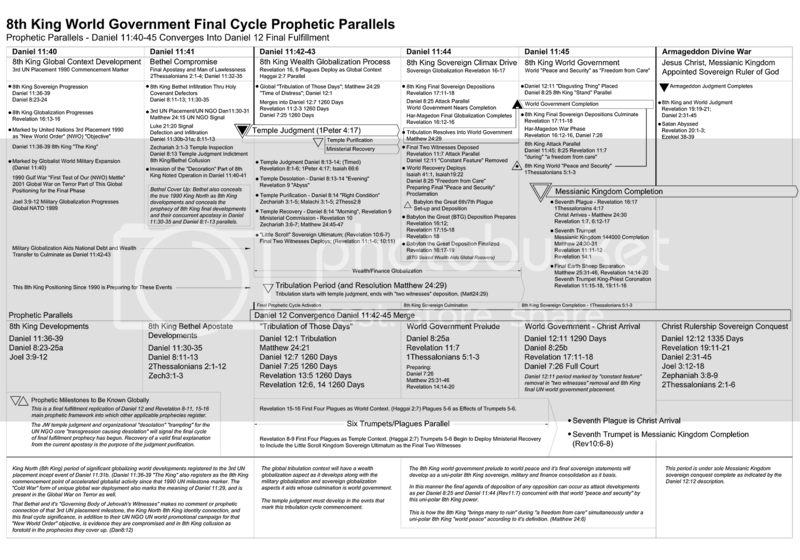 The prophecies (and graphics) do NOT identify exact dates, but they do identify significant timed periods and their ministerial and or sovereign meaning leading through these final events. Repeating the prophecy towards the same overall meaning as the first fulfillment is a technique to affirm beforehand the meaning of this final cycle of human history before Christ’s final full arrival. (Matt6:10); Affirmation of this final fulfillment meaning will come early on, and is already present in the Bethel apostasy signal, as that foretold subversion “operation of error” attempts to cover all this up. The Daniel 8:13-14 timed temple judgment will signal the initial tribulatory context event to signal the rest of the Daniel 12 periods must also fulfill in this replication from that unique temple judgment event on Jehovah’s witnesses whenever it is Daniel 11:42-45 begins merging into Daniel 12:7 1260 days. 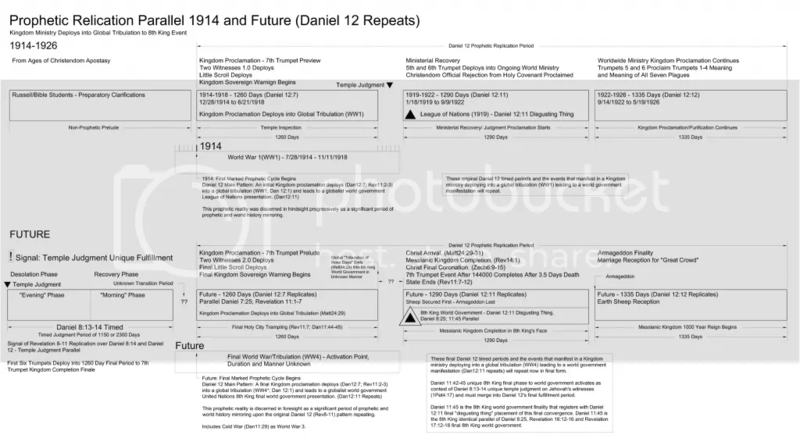 Therefore to assist visualizing these fulfillment events as they unfold, these graphics depict the timed phases (not exact dates), and general order of Daniel 8:14 and Daniel 12:7, 11, 12 in this final prophetic cycle to activate in the JW temple judgment first (1Pet4:17), WITH a global tribulation sequence beginning as Daniel 11:42-45 must converge into Daniel 12’s final fulfillment. Keep in mind Daniel 11:42-43 is the 8th King world event sequence set to activate next, not “Daniel 11:44 next” as promoted in purposeful error by the current Bethel hoax supporting “interpretation”. Thus the logic Daniel 11:42-45 must lead into Daniel 12 live and real-time becomes obvious. 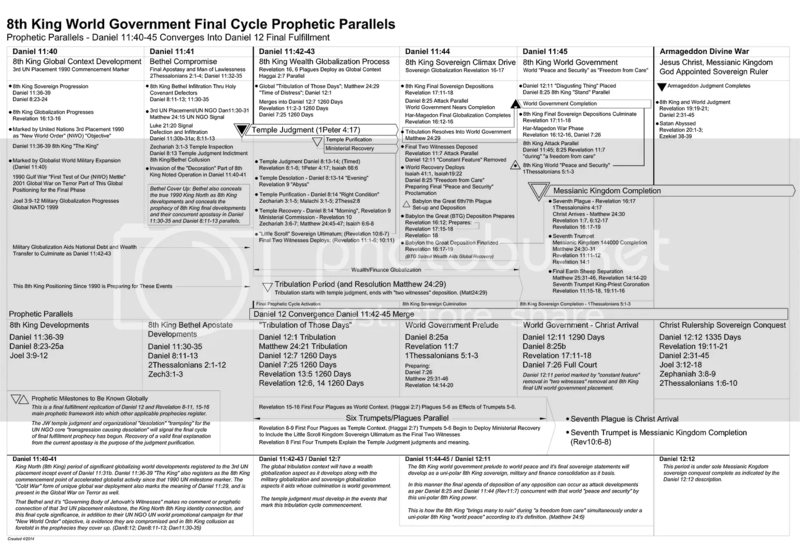 This final cycle of prophecy will result in the same Kingdom and 8th King entities, to emerge from the “tribulation of those days” resolved (Matt24:29) into a United Nations foretold world “peace and security” (1Thess5:1-3; Dan8:25) as 8th King world government completes the required sovereignty (Dan11:45; 12:11) for Messianic Kingdom deposition. The initial preview cycle laid out the meanings and sequence in those events unfolding in Daniel 12’s first fulfillment. In this way the 1914-1922 preview fulfillment resulting in incomplete sovereign entities, but in foundational form at that time, will culminate into the foretold completions of the two final “Kingdom” rivals in the 8th Kingdom and the Messianic Kingdom for the rulership of planet Earth. In this way a final warning cycle will be achieved, upon a repeating well known prophecy and meaning, rather than the current Bethel apostate hoax of a premature end. The Bethel apostasy and hoax, now concealing this final cycle truth, is why a JW organizational desolation (1Pet4:17) and UN NGO accounting (Dan8:13) must begin the cycle, to clear out the current 8th King allied obstacles in the Jehovah’s witnesses ministry. In this way the purification symbols in Daniel 8:13-14 will align with the Revelation 8:1-6 temple judgment parallels as the Revelation 8-11 seven trumpets must overlay the Daniel 8:14 and Daniel 12 timed periods for further sequential gauging of events that will be active globally.